Established in the year 1997, we, “J. P. Enterprises”, are counted among one of the leading manufacturers, suppliers and traders of Industrial Drill, Cutters, Tools & Reamer, Shaft and Milling Product. All our offered products are designed and developed by the professionals making use of advanced technologies and quality raw material. Our offered products are appreciated in the market for their attributes like low maintenance cost and high tensile strength. Being a client-centric organization, all our business activities are directed towards multiplying the contentment of our valuable customers. In order to meet the customer's requirements, we offer these products in varied sizes and specifications. We also provide paid samples of our offered range in order to meet the customers' needs. Moreover, our professionals ensure that only defect-free range is delivered at the customers' end within the promised time. Owing to the ethical business policies and customer-centric approaches, we have been able to garner a huge clientèle for ourselves. Under the visionary guidance of our mentor, 'Mr. Jaison P. Jose', we have created a strong niche for ourselves in this highly competitive market. His brilliant managerial skills, rich industry knowledge and business acumen has enabled us to stand ahead of our industry counterparts. The professionals working with us posses sound industry knowledge and wide experience of industry, which aids in manufacturing the qualitative range in bulk. Moreover, our professionals are well-aware of operating and handling knowledge of machines and technologies. These professionals work in close coordination among each other along as well as with the customers to know their needs and develop products accordingly. Regular training classes and seminars are arranged by us to keep our workforce updated with advanced technologies and latest market trends. 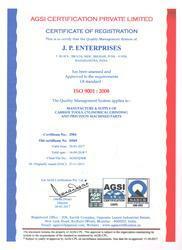 We have been able to gain the faith & support of esteemed patrons due to the optimum quality products offered by us. Due to the timely delivery of orders, transparent business dealings and ethical trade policies, we have been able to stand ahead of our industry counterparts. Following are varied factors that enabled us to become the preferred choice of patrons.